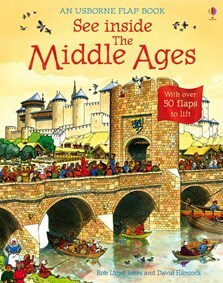 A fabulous flap book for older children showing what life was like in the 14th century. Stunning illustrations and over 80 flaps reveal fascinating historical facts of life in the Middle Ages. Scenes include a town market day, a lord’s castle, a country village and a castle under siege. Includes an illustrated who’s who in medieval society, a delightful small booklet on living in a castle and internet links to fun websites to find out more. This book takes a journey through medieval life in a ‘lift the flap’ format that encourages children to dig deeper into the past. The text is good, but it’s the little details in the illustrations that bring this book alive.